Our weaning journey, so far, has been relatively straightforward. Memories of early weaning with my daughter always played on my mind. I found the whole processes very stressful. So this time around, I was determined to make the process an enjoyable one. Not to get too worked up and educate myself so I would be filled with confidence whilst weaning my son Henry. Henry was showing all these signs that he was ready, so I felt confident that 5.5 months was a good time to start. Many mum's confuse babies who start suddenly feeding more as a sign they're ready to wean, but it's important to remember that they go through growth spurts at around four months so will naturally want to up their intake of milk, it's not normally a sign they're ready for solids. This was a mistake I made with my daughter, I weaned her at bang on four months and she really wasn't ready. Once I decided that Henry was ready, I made up quite a few vegetable and fruit purées for him to try and they all seemed to go down really well. His first foods he tried were sweet potato, broccoli, cauliflower, carrot, banana, avocado, pears. When he hit six months, I was keen to explore baby lead weaning. BLW is basically where you allow your baby to feed themselves using finger foods or even allowing them to use a spoon. Henry loves feeding himself, loves to get messy (such a boy) and has tried and liked everything that has been put in front of him. This month we are trying to make our usual family meals more baby friendly and I'm looking forward to sharing a few recipe idea's with you. 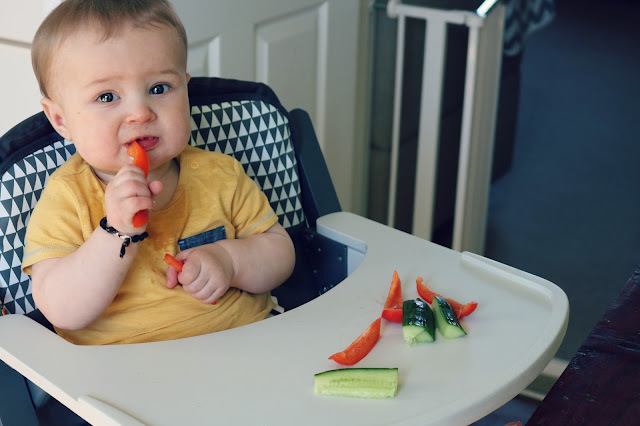 This is the first of a series of blog posts which will cover all things weaning because we are a part of the #stresslessweaning team in collaboration with Babymoov. We are working closely with a nutritionist so if you have any questions or things you would like to see from me, then please feel free to leave them in the comments. We are working with Babymoov as part of their #stresslessweaning project. I have not received payment, all opinions are my own.